What is your favorite non-coffee beverage at Starbucks? Over 30 of your replies! Adam Gears likes a “Vanilla Bean Frappuccino with a Banana in it.” By the way, I have tried that many times and it is delicious. If you blend in some honey, it’s even better. Darkkatpouncing replied, “ooh…my fav non coffee drink at sbux has to be the “sugar free” iced chai latte 🙂 #yummy!” I’ve never tried the sugar-free version of the Chai beverage, but if you’re interested, Starbucks recently posted (in their blogs) an official “how to” order a sugar free Tazo Chai beverage. April tweeted this for her favorite beverage: “favorite noncoffee drink at Starbucks: passion tea lemonade.” That’s a great standard. I drink plenty of those in the summer! Just as an aside, April produces a blog about coffee with a strong interest in Starbucks. Click here to read April’s blog. Amalia likes this one! “the strawberry blended lemonade with one pump of raspberry. Delish and refreshing. Or just a blended passion tea (tea,water,ice).” I don’t think I’ve ever tried just blending the passion tea, but I might have to give that a try! Jess has a favorite beverage that is a little bit confusing to tweet in 140 characters. Does sound delicious though! “A coconut, soy orange-mango cream frapp (made like a STCF but with the orange-mango juice instead). No classic, with coconut.” She is one awesome partner too! Betina tweeted this: “Our family are big hot chocolate fans! Extra whip :).” I do like Starbucks hot chocolate! I tend to order it a little more often in the winter than summer. Caroline‘s favorite non-coffee drink is the “Caramel Apple Spice.” Follow Caroline on twitter for legal tweets! One of my favorite non-coffee drinks is the iced soy chai latte with about an inch (or a little less) of soy foam on top of it. It’s sort of the cocoa cappuccino version of an iced chai. I really do drink a variety of beverages but I am hooked on this one. The partner who introduced me to the iced soy chai latte with foam was featured nearly three years ago in this blog post here! She’s is still one very awesome partner! Thank you to the many people who replied to me on twitter. I was totally (and happily) overwhelmed with the number of replies that I got. I had lots of fun reading everyone’s favorite drink! I hope you did too – and maybe it gave you a few ideas of something new to try. Without a doubt, if you use Twitter, I recommend that you follow everyone above! 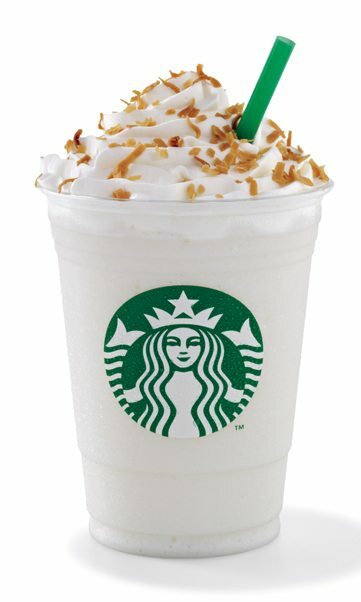 The image of the coconut creme Frappuccino was borrowed from the Starbucks newsroom website. Did you know that when the creme-based Frappuccino was introduced into the lineup in 2002, that the coconut flavor was one of the original flavors? One more visit to Evolution Fresh. Melody gets a @Kloutperk. Lipton Instant Tea. (Two thumbs up for Lipton). St. Helena Reserve Coffee: At $160 per pound, it’s by far the most expensive Starbucks whole bean coffee ever. Turning up the heat on breakfast at Starbucks. Starbucks January Espresso Beverage Tumbler – Free Grande-sized Espresso Drinks in January 2014. The January 2017 Starbucks Refill Tumbler is Back. In winter (which here is about two weeks), I like the Caramel Apple Spice as a treat. The rest of the year, if I’m going non-coffee, it’s an unsweetened passion-tea lemonade (or green tea on occasion — though it was better when it had melon syrup) or a nonfat iced Chai latte. Terrific post Melody because it shows that SB has other drinks than coffee that are great. Sure coffee is their basic drink and I sure hope they do every cup in top form and I especially know the Clover makes a great coffee, but it is nice to see that there are choices. And the iced green tea is wonderful. This would be a huge TREAT for me but I like to get it for other people: a vanilla bean coconut frapp with whip!!!! excellent. also the green tea frapp with raspberry syrup ON TOP. they really do need to bring back the melon syrup, as so many have suggested. especially for this drink. Great post Melody. I now have so many new ideas. Can’t wait to try some! I’m such a slave to coffee that there is only one thing I drink at Starbucks that isn’t that amazing bean. Calm Tea with honey. And then only when I’m sick. I am a fan of Iced Passion Tea Lemonade, no water. I used to also like Iced Black Tea Lemonade, again no water. However since Starbucks revised the Black Tea I do not drink it anymore; I believe they took out the bergamot. For summer, I like iced lattes or iced mochas. In winter, it’s definitely the hot chocolate! This was a great entry. I now have so MANY new drinks to try. @DadCooks – Sigh. It’s true. The earlier recipe of Black Tea was a little more to my liking, but I do the like the current black tea offering too. Black Tea Lemonade sweetened with light ice is my favorite non coffee drink. I love the green tea lattes. Honestly, I never get anything other than a vanilla bean frap. I just don’t know what to order! I’m going to look into that frozen strawberry lemonade though. That sounds delicious. I like black idea tea with strawberry sauce. Though I’ll admit I haven’t ordered it in a while since the cochineal extract scare. :p I’ll get back to it eventually. Have been ordering peach green iced tea lately. The peach bits are fun to eat. I’m almost always a double short long pour americano. I’d say 90% of the time. My team can tell if I’m sick, or just feeling down, because then I’ll get tea – Refresh & Calm together if I’m sick, and Earl Grey/Awake if I’m down. But, really, I came to Starbucks for the coffee. Despite the plethora of, if I may say so, amazing non-coffee drinks, for me, it’ll always be about the coffee. Sorry I missed this tweet! My fav is SF vanilla soy latte… that isn’t a standard ‘coffee’ drink right?? I have a few drinks, but one not necessarily coffee based…the closest I can think of is the Green Tea Latte. it was super yummy! I can’t believe I hadn’t thought of it myself 🙂 So thank you for posting about it! i saw these tweets, and was ‘working’ do didn’t really have the time to respond. weirdly enough, i drink iced, non-coffee drinks year round, which i’m sure you’ll agree is appropriate for me. my go to drink is generally an iced soy chai, but i do also like the iced teas/tea lemonades, and sometimes the frappucinos (which i always manage to spell wrong, and my spell check suggests fractiousness). i especially like riki’s key lime frappucino, but i think i’ve forgotten the recipe, and i no longer work in kirkland, so that one’s not happening again unless i grab the recipe from him. i kind of run the gamut on the non-coffee drinks, though, as coffee has an opposite effect on me as it does to most people, making me drowsy rather than perking me up. if you ever see me order a coffee drink, pay attention to the sugar content i request. that’s the only thing that keeps me awake: the sugar. If I am ordering something non-coffee at Starbucks it is probably passion iced tea with no water. i hear ya there, violet! iM A BIG FAN OF THE POMEGRANITE TEA LEMONADE. @TimSandor – Do you mean the iced tea called “Passion Tea” ? It’s not a pomegranate tea. Actually, it is NOT “Passion fruit tea” either – It’s just a nice herbal tea blend that Starbucks calls “Passion Tea” and you can get it as a Passion Tea Lemonade too. THAT IS EXACTLY WHAT I MEANT. THE PASSION TEA LEMONADE. I always loved the vanilla latte.. well they say that everybody loves vanilla, right? Thanks for mentioning my tweet to you. After sending that, I remembered how much I used to love Chantico drinking chocolate. I miss that stuff. They should look into bringing it back. @Kara86ster – I wish we had that here. A Mango Passion Frappuccino sounds really good! I LOVE a hot passion tea made with 1/2 hot water and 1/2 steam apple juice. Sounds weird but a little cinnamon on top totally makes this drink for me! Chiming in late here, but my fav non-coffee bev is probably a 1 pump mocha, soy, no protein, two banana, add vanilla bean chocolate smoothie in a venti cup. It’s what I get when I forget to bring my lunch and don’t want a panini. Am I the only one who misses the market salad?